Want accurate Wisconsin real estate listing information? Search local sites. You can find Wisconsin real estate listings easily on websites and apps these days, but how do you know if the data on those properties is accurate? Have you ever inquired on a property that you were interested in only to find it was not available, even though there it is, right there on your screen? Frustrating! National websites like Trulia and Zillow get data feeds from real estate brokers such as ourselves who choose to provide extra listing exposure, but the updating of data on their sites is out of our control. There’s no way of knowing how often they run those updates and the listing data can be stale and inaccurate. For the most accurate listing data on homes for sale in Wisconsin, it is best to start with a local real estate website or locally produced app that has control over their own updates. For example, firstweber.com and our free real estate apps are updated several times a day through hourly local feeds from MLS systems across Wisconsin. Changes and updates are faster and controlled locally. The same holds true for all our agent websites. Up. To. Date. That equals better real estate results for the person searching for real estate for sale in Wisconsin. NOTE: New versions of our app are available. You’ll love the excellent search experience! 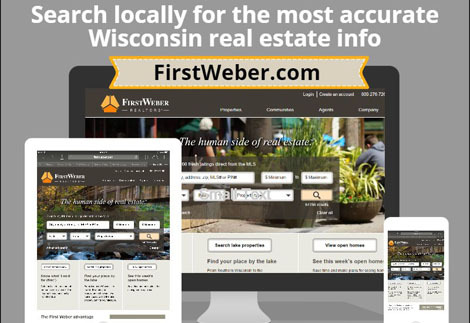 Please try out firstweber.com if you are in the market for Wisconsin real estate – everywhere from Rhinelander to Brookfield to Fond du Lac to Janesville, Madison, Racine and all places in between. We promise you’ll find our site to be accurate and an excellent search experience. Thanks for reading the First Weber Wisconsin real estate & Wisconsin living blog about where to find the most accurate data on real estate for sale in Wisconsin. Download First Weber’s free iPad/iPhone app or Android app here. Listings needed. Buyers often in competition.